The Bookshelf is happy to host author and Veteran Stan Bain. 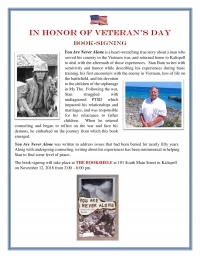 Stan will be here at the store Monday November 12th from 2:00pm to 4:00pm signing copies of his book. 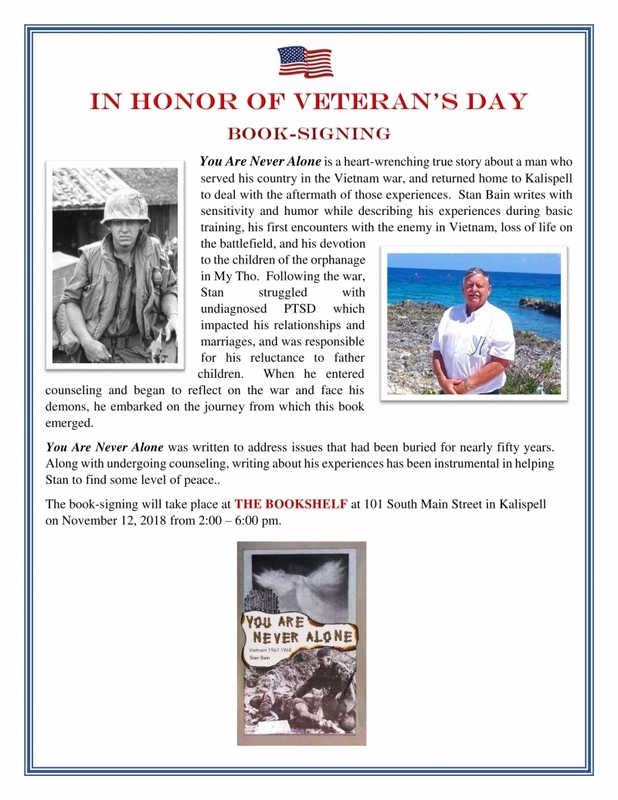 In 'You Are Never Alone' he has written an honest, heart-wrenching, and emotional account of his time spent growing up in Kalispell, serving in the Army in Vietnam, and his struggle to find peace and happiness after he came home. We are happy to spend Veteran's Day afternoon with Stan and support him and all of our Veterans past and present. Please come down to The Bookshelf and say hello to Stan and show your support of our Veterans. The Bookshelf will be donating all of the proceeds from sales of 'You Are Never Alone' to the Northwest Montana Veteran's Food Pantry. There will also be a place to donate non-perishable food and clothing items for the Veteran's Food Pantry. Your support is greatly appreciated and we would love to see you at the store!